Oak flooring is increasingly becoming one of the hallmarks of a cosmopolitan lifestyle in homes. From city centre apartments to country houses with a modern feel, oak flooring is no longer reserved for large properties and is a popular choice with young couples, busy professionals, landlords and home owners wanting to make the most of their space. At Oak Floors Online we have a wide selection of oak flooring available to suit every taste and our team of experts is always on hand to advise you of the best options for your home or property. Interior design and interior décor trends change in the same way that fashion changes, with few things remaining “in vogue” for long. Oak flooring is not a fashion trend for the home and as the saying goes, style never goes out of fashion – oak floors add true style to your home and will always look great, from the day it is installed to many years later, long after the trend for patterned carpets has come and gone! One of the main benefits that many of our customers are looking for in their oak flooring is the ease of care and maintenance compared to a thick, dust and dirt gathering carpet. When you have a busy lifestyle, you don’t want to spend your free time cleaning carpets that might have been in fashion when you bought them but now are looking a little dated. The cosmopolitan look of oak floors will look fresh and stylish for many years and will save you hours of cleaning time compared to carpets, leaving you free to go and do the things you enjoy! Of course, certain finishes on oak flooring are more traditionally cosmopolitan in appearance, generally with a lighter finish to the wood. We have a wide selection of both solid oak flooring and engineered oak flooring with a light finish to the wood. The lighter finishes are particularly popular in city centre apartments, to make the most of the light coming in through the windows or to give the appearance of more light and space by reflecting what light there is. Our engineered oak flooring in lacquered mixed grade and lacquered AB select grade are popular choices for young couples and families who are perhaps in their first home and looking to make their mark on the property whilst keeping the benefits of the practicalities of oak flooring and getting the look that they want. 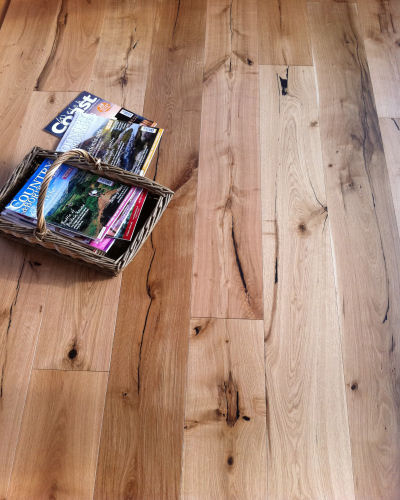 Solid oak flooring is also available in a lacquered finish and is a favourite choice of people with larger, perhaps more suburban or country properties and is popular with landlords offering long term lets in their properties. Whatever your property type and size, if you are looking for a cosmopolitan style that allows you to customise your flooring, our engineered Celtic Character Rustic is a great choice. This engineered oak flooring is stunning and has the natural features enhanced by adding dark filler to the boards before sanding, giving you a truly unique floor that you won’t find anywhere else – perfect for stylish contemporary homes. Also available for those who are looking for a lighter finish to their oak flooring is our “unfinished” range. Unfinished oak flooring is available in both solid oak and engineered oak flooring options and gives you the flexibility to finish the floor to your own taste and style on site. If you want to add a light wax oil, you can create a warm, light affect, or perhaps you would prefer to add your own lacquer to your floor to coordinate with your existing décor and soft furnishings? For contemporary living, oak flooring is a great place to start.